17 Commercial Real Estate and Properties in Cairns are listed in 8 categories. We have 103 Retail Shops for Sale & Lease , 64 Offices for Sale & Lease , 42 Industrial Warehouses for Sale & Lease , 21 Development Lands for Sale & Lease , 5 Commercial Farms for Sale & Lease and 4 Hotels and Leisure for Sale & Lease . First Time To Market - Tenanted Investment 1/3-5 Salvado Drive, Smithfield Contact agents Helen and .. Offered for Sale as a tenanted investment 511 sqm strata titled lot 677 sqm net lettable $63,860 + GST per annum rental Tenant pays all outgoings Lease 3 years expiring 2020 with option to 2023 Good return Accessed off busy Mt Milman Drive, a tightly held commercial precinct that runs parallel to the Captain Cook Highway, a 20 minute drive north of Cairns CBD. The lot is one of a complex of five strata titled lots. This modern showroom/warehouse has been constructed using concrete tilt wall and has fully insulated metal roofing. The high grade showroom on the ground floor is fully tiled and has suspended ceilings throughout. The fit out consists of a modern air conditioned showroom with a built in marble top retail counter and one office to the rear which includes a bathroom for customers and staff. The showroom continues up marble stairs to the mezzanine area of 166 sqm. There is a fully tiled managers office with picture window overlooking Salvado Drive and a large tiled kitchen/lunchroom. The warehouse has both front and rear high roller door access of 4.2 metres and a forklift loading zone to the load bearing mezzanine showroom. The warehouse also has separate amenities for staff. There are five on site allocated parking bays for customers and staff with on street parking available. Contact: Exclusive agents Helen Crossley and Grant Timmins Ray White Commercial Cairns for more information. 212 Sqm Available For Lease In Portsmith Contact agent Helen Cross.. Warehouse approximately 164 sqm Air conditioned showroom/office of approximately 32 sqm Mezzanine office approximately 16 sqm Rear roller door access Plenty of off and on street parking Excellent street visibility Good signage available Security gate and cameras to rear Contact: Exclusive agent Helen Crossley Ray White Commercial Cairns for more information. Scott Street Showroom/warehouse For Lease Contact agent Scott Green..
108 Scott Street 520 sqm of air conditioned showroom with rear storage is available for lease in early 2019. Currently occupied by Howards Storage World, previously by Glenfords Tools. Excellent signage and visibility to busy Scott Street, in the middle of Cairns' industrial sector. The warehouse includes double roller door access, 5 metre height for pallet racking, office and lunch room and male/female toilets. Contact: Exclusive agent Scott Green Ray White Commercial Cairns for more information. For Sale Industrial Building Portsmith Maritime Precinct Contact agents Helen and .. This strata titled complex is on the corner of Cook Street and Fearnley Street in the Portsmith Industrial Estate and only five minutes to Cairns CBD. The site is ideally suited to the maritime industry because of its proximity to the Portsmith boat ramp. Lot 1 has an area of 377 sqm is available for sale. Contact: Agents Helen Crossley and Grant Timmins Ray White Commercial Cairns for more information. Strata titled lot for sale in complex on the corner of Cook Street and Fearnley Street in the Portsmith Industrial Estate. The site is ideally suited to the maritime industry because of its proximity to the Portsmith boat ramp and is only 5 minutes from the CBD. Lot 2 has an area of 521 sqm. Contact: Agents Helen and Grant Ray White Commercial Cairns for more information. 521 Sqm Industrial Showroom/office For Lease Contact agents Helen and ..
Net lettable area 521 sqm approximately with clear height of 6 metres approximately and wide roller door access to the side and rear. Kitchenette and unisex disabled toilet with mezzanine storage area above of 28 sqm approximately. Five allocated car parks and street front parking for customers. Five exits from the building, two with frontage to the Cook Street side, one with frontage to Fearnley Street, one to the car park side and a wide, electric roller door. Great position for marine trade with the Fearnley Street boat ramp only 50 metres away. Contact: Agents Helen Crossley and Grant Timmins Ray White Commercial Cairns for more information. Freehold Site Fully Tenanted, Main Arterial Road - Innisfail Contact agent Scott Green..
bull; 21 Palmerston Drive, Innisfail bull; Leased to the same business for the past 26 years bull; 422 sqm total building area bull; 1,343 sqm land area bull; Prominent site in busy commercial precinct bull; Neat, well maintained property Contact: Exclusive agent Scott Green Ray White Commercial Cairns for more information. Investment Property On Main Arterial Road - Atherton Contact agent Scott Green..
bull; 20A Tolga Road, Atherton bull; 5 + 5 year lease to established rural consultancy business bull; 300 sqm total building area bull; 1,722 sqm land area bull; 3% annual rental increases bull; Neat, attractive complex in popular commercial precinct Contact: Exclusive agent Scott Green Ray White Commercial Cairns for more information. For Lease, New Showroom/warehouse - Mt Millman Drive, Smithfield. Contact agent Scott Green..
Construction has commenced on this new complex available early 2019. 195 sqm front corner tenancy remaining, balance of building leased to a National company. On a prominent corner site providing the new occupants excellent visibility and signage. Warehouse to include: high clearance, internal toilets and side roller door. Concrete tilt slab construction. Developer can assist with tenant works by negotiation. Rental $32,500 per annum + GST. Contact: Agent Scott Green Ray White Commercial Cairns for more information. Located on Sheridan Street and in the shopping centre at Bentley Park, they are both well located to attract long term and casual clients. Bentley Park was opened to the public on February 2016 in the busy Centenary Park Shopping Centre in Bentley Park. The centre contains the Department of Transport, an IGA supermarket, Pizza Hut, Bakery and a host of other cafes and fast food outlets which attract a large number of people into the centre each day and into the evenings. The clubs' position in the centre gives it fantastic exposure and ample easy parking. These premises are on ground level and were purpose built for the gym with the building being extremely energy efficient. Far larger than most typical 24/7 box gyms, there is plenty of room to move around the new range of Health Stream strength equipment. However the star of the show is the complete range of TRUE Fitness cardio equipment. This equipment is Wifi connected with email and internet access, virtual reality trails and even virtual reality training programs. Being less than 2 years old, all the equipment is still like new and is regularly serviced and well maintained. The bathrooms are first class with a separate male and female facilities. There is an excellent website making easy sign up and offers potential patrons the option of an easy membership with no long term lock in contract. Everything is in tip top condition in these easy to run gyms with modern equipment and up to date systems. Circumstances have forced an urgent sale so these gyms must be sold. Full information, including valuation is available. Contact us so you can start your new North Queensland relaxed lifestyle. Ideal Warehouse 540 M2 - South Cairns Contact agent Scott Green.. Situated at 37 Hargreaves Street, Bentley Park, this property has Bruce Highway exposure 35,000 cars passing daily. With a six metre clearance, a width of 15 metres and length of 36.4 m2. The warehouse has two small internal offices constructed within and a side 'lean to' of approximately 100 m2. The yard is fully concrete sealed with a wash bay underneath the side lean to connected to a grease interceptor. Three roller doors and chain wire fencing surround the property. Available within a month and priced right! Contact: Exclusive agent Scott Green Ray White Commercial Cairns for more information. Inner City Showroom / Warehouse 990 M2 Contact agent Scott Green..
990 m2 split between showroom, warehouse, offices and mezzanine storage. Located on Hannam Street, 2 kilometres to CBD and close to port, rail, air and train transport routes. Ground floor 330 m2 air conditioned showroom with 450 m2 approximately warehouse with a high 6 metre clearance and electric roller door good ventilation. 220 m2 mezzanine includes an air conditioned office and open storage area with forklift access. Owners will remodel to suit users. Near new property in excellent condition. Contact: Exclusive agent Scott Green Ray White Commercial Cairns for more information. 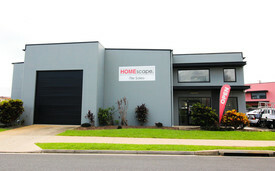 155 M2 Showroom / Office, Highly Exposed Contact agent Scott Green.. Attractive showroom or office located on the busy intersection of Mulgrave Road and Aumuller Street, Westcourt. Floor area of 155 m2 with a 32 m2 storeroom. Approximately 8.5 metre wide shop front with generous signage options available on the shop front and building facade. Good rear access is also available via double doors. Ample roof top and off street parking for customers. Available for lease now and reasonably priced. Contact: Exclusive agent Scott Green Ray White Commercial Cairns for more information. Large Retail Showroom - Mulgrave Road Contact agent Scott Green..
1,052 m2 located at Showground Shopping Centre, 157 Mulgrave Road, Cairns. Join Toys R Us, Cash Converters, Radio Rentals, Zarraffas Coffee, Subway and a multitude of other good retailers in this busy centre designed with the shops around the perimeter of the car parking. The premises is highly exposed, has high clearance, is air conditioned and has rear access with loading bays. Contact: Exclusive agent Scott Green Ray White Commercial Cairns for more information. Situated on the corner of Grace and Charles Streets, Innisfail. Previously Video Ezy for 15 years, the property has an excellent position with high visibility and would be suitable for many uses. Shop dimensions are 12 x 22.5 metres with a 3 metre ceiling height. Fully air conditioned with recessed lighting, male and female toilet and a small, private office. Large front customer counter at entry, access via a disabled ramp and double doorway. 12 metre shop front with additional shop front along Charles Street. Near BCF, KFC, NQS and Government offices. Contact: Agent Scott Green Ray White Commercial Cairns for more information. Great Location! High exposure to the main highway! Easy Access! This 400m2 shed has a huge air conditioned office and offers versatility to suit a variety of business types. There is a very spacious showroom with full glass frontage. The allotment is 1474m2 and has sealed aprons for all weather operations and ample parking. Fully tenanted and showing good returns this is a hassle free long term investment in a great location!